I’ve said on more than one occasion that it was gaming that initially got me into programming. Initially just cheating at games (I hacked my Bard’s Tale save and I modified the source code in Lemonade Stand), but what I really wanted to do was create my own games. That dream pretty much went away when I left the computer science program in college and discovered the web, but I’ve toyed with the idea of building my own web-based games from time to time. 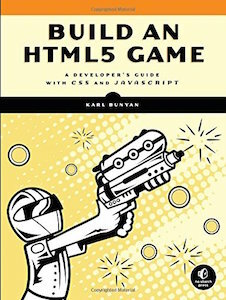 A while back, I was lucky enough to get a copy of “Build an HTML5 Game” by Karl Bunyan. Finally, the book wraps up by talking a bit about more advanced topics, like performance tuning, WebGL and deployment issues. This is a good section, but pretty slim. I think in the next edition this could be expanded significantly. The book’s definitely packed with information now, but making this last portion even larger could make a great book even better. p.s. As a slightly off topic aside, this was my first introduction to Modernizr. While I had certainly heard of it before, I had never actually used it. The game you develop in the book makes heavy use of it and I’m happy I had a chance to actually use it. I didn’t know it had a loader feature with fallback support. That was pretty darn neat.